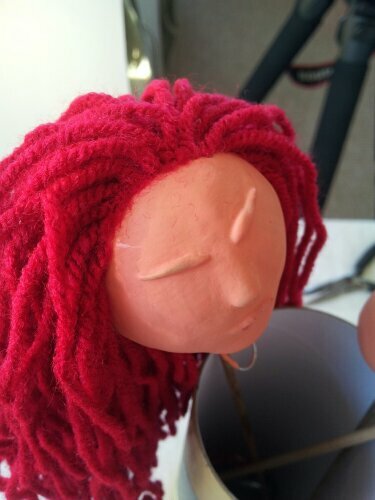 Sound and vision: female puppet has hair. This is the result of staying up til 1am with Homeland on my computer as background noise. It’s a combination of task and reward: Homeland was a distraction I used when procrastinating. Yesterday was a busy day and I wanted to relax and switch off (by watching an intense TV program? Hmmm.) 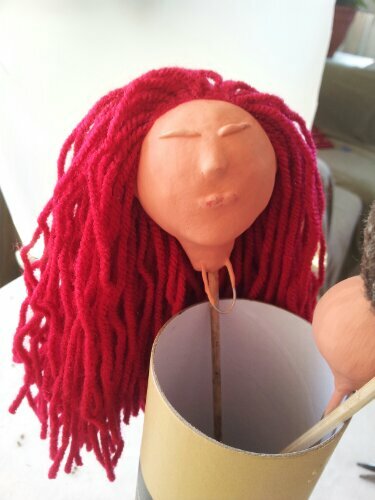 but I also don’t have a great deal of time until the second year show, so I needed to work on my puppets. So I cut loads of lengths of red wool and glued each one to the puppet’s head whilst getting a large hit of drama (five episodes from series three, to be exact). I’m pleased with the result. I have no idea who the puppet is or how she interacts with the male. Emergent practice is a scary place to work from if, like me, you really like knowing where you’re headed. It feels very uncomfortable and my inner critic is saying nasty things like, “it’s going to be rubbish – you’ve never made puppets before! What makes you think you can do this?” I’m scared that I can’t make the bodies, although I felt scared that I couldn’t make the heads and they’re turning out okay so far. I’m scared that when I’ve made the bodies and clothed them and the faces are painted and they’re ready that I won’t know what to do with them. But I do have techniques for creating characters – I have some worksheets from a creative writing course I attended a couple of years ago. I could interview each puppet and film that or, at least, record the sound and then gather some other footage to put with it. It’s going to be okay. This entry was posted in sound and vision and tagged creating characters, creative techniques, inner critic, making puppets, sound and vision by Julia Fry. Bookmark the permalink.